YouGov | Is air pollution clouding our physical and mental well-being? 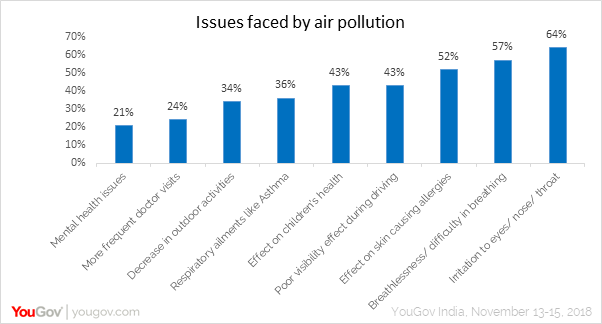 on November 22, 2018, 11:48 a.m.
YouGov survey on air pollution in India reveals over three-fourth respondents think air pollution is a pressing concern and needs immediate attention. The problem of pollution seems to be the most severe in the state of Delhi where 81% people think the air quality is unhealthy or toxic. In Bangalore 29% think the air is unhealthy or toxic while in Mumbai 40% think so. Indians believe traffic to be the biggest cause for air pollution, especially in the densely populated states like New Delhi, Maharashtra, U.P., Karnataka and Tamil Nadu. Burning of waste and reducing number of trees are seen as other top causes of pollution in the country. Around two-third of people (65%) spend up to an hour a day in traffic, with a little over a fourth of women (28%) spending less than 30 minutes. 22% people spend 1-2 hours in traffic every day, suggesting high exposure to pollutants on a daily basis. This is especially true among residents of New Delhi, where heavy traffic, burning of waste and industrial smoke have emerged as the top reasons for pollution. Interestingly, 65% of women and 71% people aged between 35-40 years pointed out construction work across city also being a contributing factor. Close to half respondents feel the worst victims of air pollution would be children, with women feeling that more strongly than men. Pollution does not impact a person just physically but also might take a toll on mental well-being, directly or indirectly. Majority of people (87%) admitted to being personally affected by rising levels of air pollution, more so in tier 1 cities compared to other city tiers. 64% people reported feeling irritation in their eyes, nose and throat as the most visible impact of air pollution, more so among residents of Delhi compared to other states. Breathlessness (57%) and allergies on the skin (52%) are some of the other issues faced by people. Close to a quarter of overall respondents reported frequenting hospitals/ doctors more often while a third mentioned decrease in outdoor activities due to high levels of pollution in the air. 21% people claimed to have faced mental health issues like depression due to growing pollution problem, with residents of tier-1 cities reporting more such cases than people of other city tiers. Surprisingly, women in tier-1 cities seem to be more affected by pollution compared to men and compared to women in other tier cities, reporting more cases of respiratory ailments like asthma, mental health issues like depression and also indicating more frequent visits to the doctors. Close to 30% respondents aged between 20-25 years also pointed out pollution adversely impacting plants and animals. Despite experiencing alarming repercussions of pollution, very few have done anything to safeguard their health. Although irritation in their eyes/nose remained a dominant concern for people, only 27% have taken an allergy/ lung test off late to ensure they are safe. How can government tackle this problem? 45% people reported being very or extremely dissatisfied with the Government’s actions to address the issue of air pollution while 39% remain unsure. Dissatisfaction is the highest in Delhi, with 53% stating their unhappiness with the government. Banning certain products that result in more pollution like plastics, firecrackers, etc. emerged as the top methods for the government to tackle the problem of air pollution in the country, with a higher number of females saying that. Prohibiting open burning of garbage and fining industries excreting waste are some of the other measures listed by people. Notably, 72% people in Delhi proposition the idea of government investing in air pollution tracking and minimizing devices in public places while three-fourth respondents of Karnataka and those aged between 25-30 years are rooting for awareness campaigns to drive sensitivity towards the issue. How can one tackle this problem? When it comes to their own self, people are willing to take steps to ensure they can make the place around them healthier and liveable. Most people are happy to use eco-friendly products and conserve energy at home and workplace to reduce air pollution. A considerable proportion of people also propose recycling/reusing products (66%) and choosing car pools and public transport over private cars (64%) to lessen pollution. This emerges as the strongest measure among people of Delhi, who have earlier reported traffic being one of the biggest causes of pollution in the city. 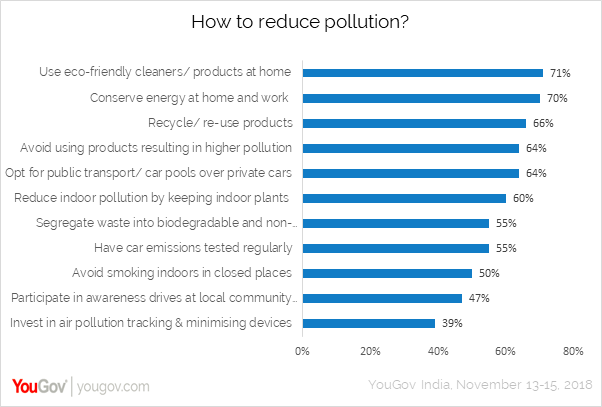 Interestingly, 39% people choose to take things in their own hands and propose to invest in air pollution tracking and minimising devices to ensure a safe and clean environment around them. 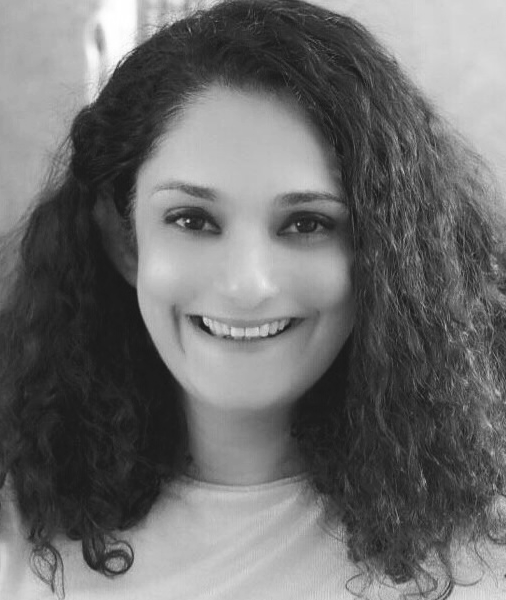 Data collected online by YouGov India among 1,049 respondents in India between 13th and 15st November, 2018 using YouGov’s panel of an online representation of India.